How to open the foundation refill? 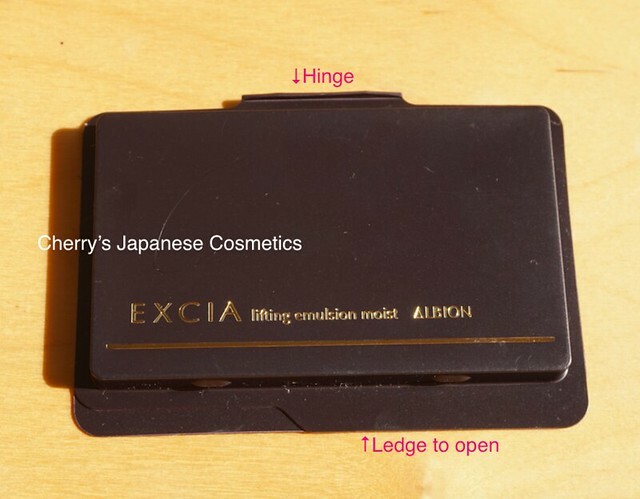 Recently, we got a question that how to open the powder foundation refill. We ship tons of foundation refills to the customers, it was a first asking. To be honest, I had also confused to open once. I could open pretty soon by myself, but I know she is not only one person to confuse to do. She is an obedient, I guess there could be someone who also confused like me or her, but hesitated to ask. Checking what I have currently, there are nothing perfect to show. Please let me talk with a foundation sample, the same basic constructions. This is the sample package of Albion Excia AL Emulsion foundation. This is just a sample, and guess can you see how to open? If you read Japanese, you will understand this is the back side, at a glance. But I know there are tons of the audiences who does not read Japanese. Could you find this is the back side, so easily? I guess you are not only one person who does not. 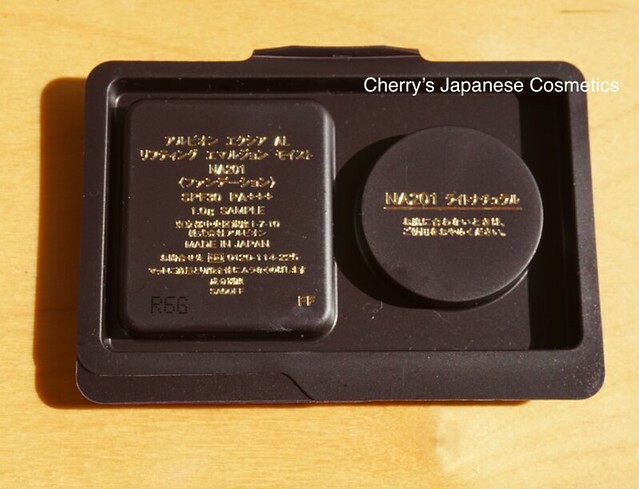 They are saying “what this product is, the shade number is (NA201) , SPF & PA is, SAMPLE (you may see), product of Albion”. That’s all. The front side is simply this. Those refills (and samples) are not rocked. Sometimes sealed, but just put in the soft plastic case. They are just closed tightly to protect the fragile product, like powder foundation. Their construction is with two ledges. One is the hinge, the other is the ledge to open. You will see the ledge on the upper of the case. Sometimes it is placed the left flank? I mean the narrow side. I had seen some refill cases, which had a small curled ledge, it is east to find the ledge to open. It is rare case to see such a user friendly cases. This Excia is easy one. Can you find in this refill? This is ADDICTION Powder foundation refill. 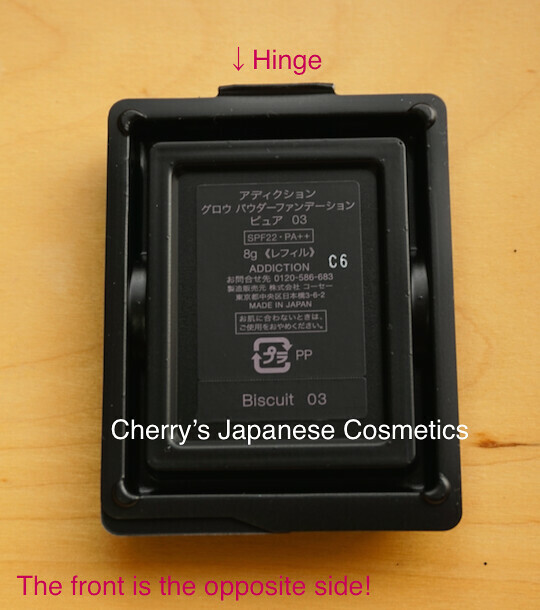 We take photos of all the items before the shipping, it is to check whether it is the correct number of the shades (Biscuit 03), and the produced number ( “C6”). I checked most of the pictures what we had shipped recently, sadly we have not taken the photos of the front. If you do not read Japanese, I guess some of you do not find this is the back side. The written is meaning “What this is, SPF & PA, quantity, Additcion product, and the shade, please recycle this plastic”. The front side, you will see only “ADDICTION” letters. You may find the hinge soon, but where is the ledge to open? It’s not easy to see in this picture. Let me change the color tone. I circled by blue, you will see the seam. You may see the same thing on the front side too. Finally what you need is… Scissors, to cut the hinge. 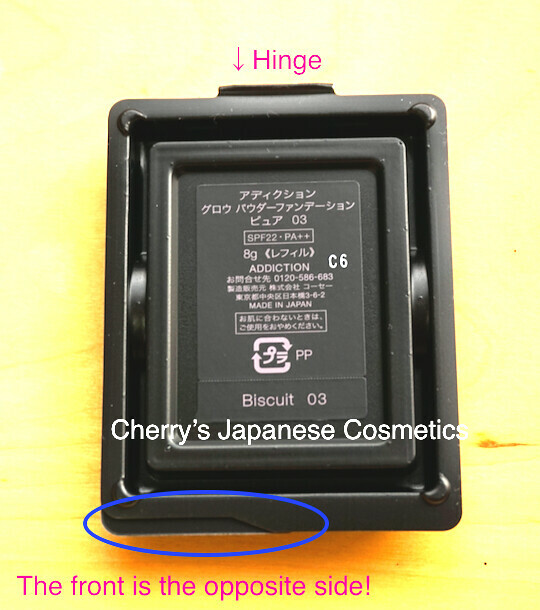 You do not find what is the hinge? Anyway, cut all the edges.